Naloxone, also known as Narcan among other names, is a health system. Naloxone is available as a generic medication and is not very expensive. Its wholesale price is between 0.50 and 5.30 USD per dose. Naloxone is useful both in acute opioid overdose and in reducing respiratory or mental depression due to opioids. It is included as a part of emergency overdose response kits distributed to heroin and other opioid drug users, and this has been shown to reduce rates of deaths due to overdose. A prescription for naloxone is recommended if a person is on a high dose of opioid (>100 mg of morphine equivalence/day), is prescribed any dose of opioid accompanied by a benzodiazepine, or is suspected or known to use opioids nonmedically. Prescribing naloxone should be accompanied by standard education that includes preventing, identifying, and responding to an overdose; rescue breathing; and calling emergency services. Naloxone may be combined with a number of opioids, including buprenorphine and pentazocine, so that when taken orally just the opioid has an effect; but if misused by injecting or taken in large doses, the naloxone blocks the effect of the opioid. This combination is used in an effort to prevent abuse. In a meta-analysis of people with shock, including septic, cardiogenic, hemorrhagic, or spinal shock, those who received naloxone had improved blood flow. The authors of the meta-analysis recommend further study and randomized trials to determine the suitability of naloxone as a treatment for shock. Naloxone is also experimentally used in the treatment for congenital insensitivity to pain with anhidrosis, an extremely rare disorder (one in 125 million) that renders one unable to feel pain, or differentiate temperatures. Naloxone can also be used as an antidote in overdose of clonidine, a medication which lowers blood pressure. Naloxone has little to no effect if opioids are not present. In people with opioids onboard, it may cause increased sweating, nausea, restlessness, trembling, vomiting, flushing, headache, and has in rare cases been associated with heart rhythm changes, seizures, and pulmonary edema. Naloxone has been shown to block the action of pain-lowering endorphins which the body produces naturally. These endorphins likely operate on the same opioid receptors that naloxone blocks. Naloxone is capable of blocking a placebo pain-lowering response, both in clinical and experimental pain, if the placebo is administered together with a hidden or blind injection of naloxone. Other studies have found that placebo alone can activate the body's μ-opioid endorphin system, delivering pain relief via the same receptor mechanism as morphine. It is currently unknown if naloxone is excreted in breast milk. Currently, no established clinical trials have been conducted in patients with insufficient kidney function or liver disease, and as such, these patients should be monitored closely if naloxone is clinically indicated. Naloxone has an extremely high affinity for μ-opioid receptors in the central nervous system (CNS). Naloxone is a μ-opioid receptor (MOR) competitive antagonist, and its rapid blockade of those receptors often produces rapid onset of withdrawal symptoms. Naloxone also has an antagonist action, though with a lower affinity, at κ- (KOR) and δ-opioid receptors (DOR). Unlike other opioid receptor antagonists, naloxone is essentially a pure antagonist with no agonist properties. If administered in the absence of concomitant opioid use, no functional pharmacological activity occurs (except the inability for the body to combat pain naturally), in contrast to direct opiate agonists, which elicit opiate withdrawal symptoms of both opiate-tolerant and opiate-naive patients. No evidence indicates the development of tolerance or dependence on naloxone. The mechanism of action is not completely understood, but studies suggest it functions to produce withdrawal symptoms by competing for opiate receptor sites within the CNS (a competitive antagonist, not a direct agonist), thereby preventing the action of both endogenous and xenobiotic opiates on these receptors without directly producing any effects itself. The Ki affinity values of (−)-naloxone for the MOR, KOR, and DOR have been reported as 0.559 nM, 4.91 nM, and 36.5 nM, respectively, whereas for (+)-naloxone, 3,550 nM, 8,950 nM, and 122,000 nM, respectively, have been reported. 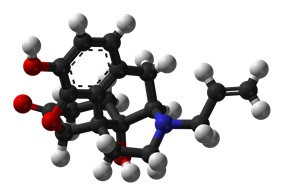 As such, (−)-naloxone appears to be the active isomer. Moreover, these data suggest that naloxone binds to the MOR with approximately 9-fold greater affinity relative to the KOR and around 60-fold greater affinity relative to the DOR. When administered parenterally, as is most common, naloxone has a rapid distribution throughout the body. The mean serum half life has been shown to range from 30 to 81 minutes, shorter than the average half life of some opiates necessitating repeat dosing if you must stop opioid receptors from triggering for an extended period, unnecessary in an emergency clinical sense. Naloxone is primarily metabolized by the liver. Its major metabolite is naloxone-3-glucuronide which is excreted in the urine. Naloxone is most commonly injected intravenously for fastest action, which usually causes the drug to act within a minute, and last up to 45 minutes. It can also be administered via intramuscular or subcutaneous injection. Finally, a wedge device (nasal atomizer) attached to a syringe may be used to create a mist which delivers the drug to the nasal mucosa, although this route of administration is not FDA approved and is more common outside of clinical facilities. The individual is closely monitored for signs of improvement in respiratory function and mental status. If minimal or no response is observed within 2–3 minutes dosing may be repeated every 2 minutes until the maximum dose of 10 mg has been reached. If there is no response at this time alternative diagnosis and treatment should be pursued. If patients do show a response they should remain under close monitoring as the effects of naloxone may wear off before those of the opioids and they may require repeat dosing at a later time. Naloxone is used orally along with Oxycontin Controlled Release, and helps in reducing the constipation associated with opioids. Enteral administration of naloxone blocks opioid action at the intestinal receptor level, but has low systemic bioavailability due to marked hepatic first pass metabolism. In April 2014, the US Food and Drug Administration (FDA) approved Evzio, a hand-held automatic injector naloxone product that is pocket-sized and can be used in non-medical settings such as in the home. It is designed use by laypersons such as family members and caregivers of opioid users at-risk for an opioid emergency, such as an overdose. The approval process was fast-tracked as one initiative to reduce the death toll caused by opiate overdoses. At the time of approval, an estimated 16,000 annual deaths were attributed to prescription opioid overdoses in the US. The patent for naloxone has expired. It is available in generic forms. Trade names include: Narcan, Nalone, Evzio, Prenoxad Injection, Narcanti, and others. In the US, naloxone is classified as a prescription medication, though it is not a controlled substance. While it is legal to prescribe naloxone in every state, dispensing the drug by medical professionals (including physicians or other licensed prescribers) at the point of service is subject to rules that vary by jurisdiction. While paramedics have carried naloxone for decades, law enforcement officers in many states throughout the country carry naloxone to reverse the effects of heroin overdoses when reaching the location prior to paramedics. As of July 12, 2015, law enforcement departments in 28 states carry naloxone to quickly respond to opioid overdoses. Laws in many states have been changed in recent years to allow wider distribution of naloxone. Several states have also moved to permit pharmacies to dispense the medication without the patient first seeing a physician or other non-pharmacist professional. Over 200 naloxone distribution programs utilize licensed prescribers to distribute the drug, often through the use of standing medication orders  whereby the medication is distributed under the medical authority of a physician or other prescriber (such as a pharmacist under California's AB1535. A survey of US naloxone prescription programs in 2010 revealed that 21 out of 48 programs reported challenges in obtaining naloxone in the months leading up to the survey, due mainly to either cost increases that outstripped allocated funding, or the suppliers' inability to fill orders. The approximate cost of a 1 ml ampoule of naloxone in the US is estimated to be significantly higher than in most Western countries. Projects of this type are under way in many North American cities. CDC estimates the US programs for drug users and their caregivers prescribing take-home doses of naloxone and training on its use are estimated to have prevented 10,000 opioid overdose deaths. Healthcare institution-based naloxone prescription programs have also helped reduce rates of opioid overdose in North Carolina, and have been replicated in the US military. Programs training police and fire personnel in opioid overdose response using naloxone have also shown promise in the US and effort is increasing to integrate opioid fatality prevention in the overall response to the overdose crisis. Pilot projects were also started in Scotland in 2006. Also in the UK, in December 2008, the Welsh Assembly government announced its intention to establish demonstration sites for take-home naloxone. Naloxone is the INN, BAN, USAN for the medication. 2013 documentary film Reach for Me: Fighting to End the American Drug Overdose Epidemic interviews people involved in naloxone programs aiming to make naloxone available to opioid users and pain patients.